a) There’s nothing else here. b) It offers something that the existing public music education network can’t. I’m going to bang a very familiar drum now. Unique dividends require unique practices – pedagogical ideas and concepts that push the musical and social envelope. Again, I differentiate sharply between practice, and genre or medium or even format. The new concept of facilitated improvisations, popularized in Europe and now expanding in practice on this side of the Atlantic, is rooted in the same structure of one person issuing orders to a host of subservient others. The Music Learning Revolution conference in London in October drove this point home, when the centre of all attention during the closing act was a “coordinator” standing at the heart of a choral “improvisation” signaling and commanding preplanned musical elements. (Photo at the top.) I call this the “smiling tyrant” effect – participants are still largely disempowered, but they’re told they’re not by a happy, energetic, passionate autocrat. Printed music is not a dictator: it’s one of a number of boundaries required for all creative and artistic output. Removing the paper requires adding other constraints, so what compromises are made becomes a question of pedagogical objectives. I’m not criticizing the art form, process or product of these initiatives, only the myopic suggestion that somehow they are more socially oriented than conventional conducted ensembles. They are not: the leadership concept is entirely the same. And it’s the leadership concept that has to change more so than the genre or medium. And that’s been my major area of research for the last 2-3 years. It has been a fascinating journey, and one key finding is that, as with everything else, it’s not a case of “either/or” but one of “both/and” – that there are spaces and times in which strong centralized leadership is essential and other times when it is absolutely dispensable – but many times in which strong leadership early can lead to greater autonomy and musical/social cohesion later. The fundamental question has been whether the leadership focused on product, or on process. Which brings me to my current project: a research study in which the musical products I’m asking study participants to evaluate have been generated through very different processes, one of which might prove very surprising. I’m inviting everyone I know – and people I don’t know – to help by completing the survey. It’s very simple, and involves rating 18 musical excerpts, none longer than 78 seconds, on some straightforward criteria. It should take no longer than 30 minutes to complete. So please, take thirty minutes and participate. At some point in the future when I have a critical mass of data I’ll publish the results and elaborate on the methods. It’s a unique practice, of this I’m certain. I’m not claiming yet it produces a unique dividend, but it might bring us one step closer to finding it. You’re also right that a smiling tyrant is still a tyrant. (Dudamel, anyone?) There’s quite a lot of debate around the role of the teacher in informal learning, which is as it should be. Anyone who thinks that there’s a single form of music learning that works perfectly and in every context needs their head examined. El Sistema is, of course, extraordinarily goal-oriented, indeed that’s one of its unique selling points. It’s always all about the concert. So I think it’s great that you’ve brought up this article – I didn’t know it myself – but it seems to raise rather significant questions for a goal-oriented orchestral training program. Finally, you start off by apparently buying into the myth that El Sistema was born into a music education void. Venezuela wasn’t an exception to the rule, as Ludim Pedroza’s recently published work reveals (cited in my book); it actually had a thriving culture of formal and informal music learning and youth music making. Abreu didn’t even create the first “Sistema” youth orchestra. The myth of the country as a music education desert was one that Abreu created as part of his self-mythologisation and justification for his own program. By the way, you can find the Toronyi-Lalic article here: https://geoffbakermusic.files.wordpress.com/2014/07/toronyi-lalic-article.jpg. Having just re-read it, I’m struck again by how, behind the deliberately contrarian tone and the sense that he probably wrote the article in about half an hour, he gets closer to the truth about El Sistema than some people who are considered, or consider themselves, experts on the program and have been “studying” it for years. He was bang on about the media response to El Sistema – as a journalist, he knew what he was saying – and those words are still very relevant today. I’ve attempted several times to respond to Jonathan’s essay and to Geoff’s responses, each time I have hesitated through the lack of consideration to several aspects of this. Okay, so I’ve had more than enough time to consider this so here’s my take on this entire topic – and some of the more recent developments like the Super Bowl YOLA issue discussed elsewhere. 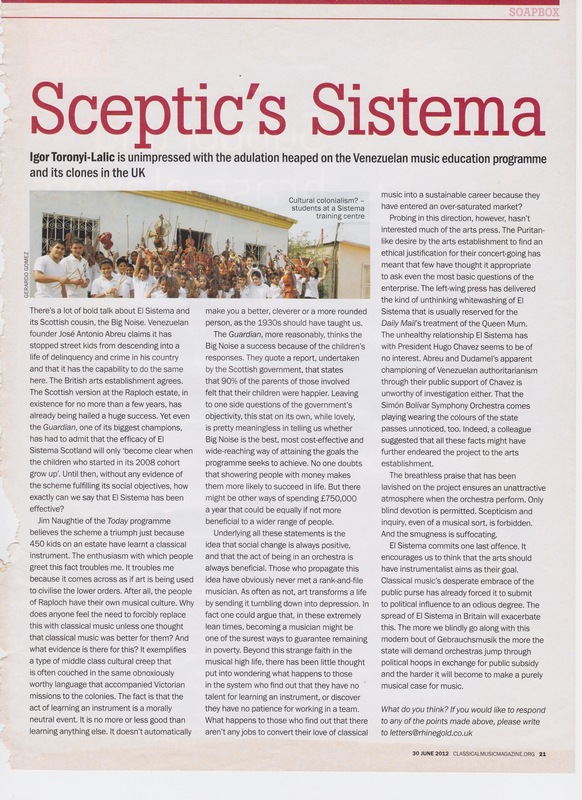 A. Miraculous belief – El Sistema as a magical phenomenon where classical music intercedes in a disadvantaged child’s life, their family, and the community and this amazing process transforms them from hopelessness to an almost self-actualised existence. The orchestra is the social movement to which they belong, and this in its almost miraculous way, astounds, and in astounding, transforms forever the community where this phenomenon occurs. It is about a beautiful difficulty overcome and a transformation brought about by the power of music and the belief in the child and their musical community. It is a classical music process. B. Fantastic belief – El Sistema is a complex, powerful and fascinating process which taps into several areas of known human behaviour and support mechanisms. It is particularly effective for the social restoration of disadvantaged children. Music is the key to it all, particularly classical music and the process of group learning an acoustically-based instrument in the context of an orchestra – a ‘natural’ and ordered process. The transformation is brought about, not by magic, but by a social/musical union drawing the children together in this complex interrelated union, which serves to fortify them and strengthen them as individuals and collectively. Complex music is the key to this process – and therefore it is a result of an encouraging supportive musical environment, unable to be duplicated in any other environment with an almost ‘pygmalion’ effect. It is a music education process. C. Reasoned belief – The Sistema approach is a social learning engagement which utilises several social processes, including collective music making and triggers, to enable the child – all children, but particularly advantageous for those living in disadvantage – to build self-worth, establish capability, learn about social norms, respect, and the ability to interrelate communally, and individually. It is a creative environment where self-expression is encouraged. Large ensemble instrumental music is one of the mechanisms utilised to help in this process. Classical music is the starting point because it is so musically neutral to most children, and is new to all the children taking part – therefore it is without prejudice and no one is advantaged or disadvantaged. Large ensembles are best given that they are a collective, and provide a ‘safety in numbers’ process for the children who may fear the embarrassment of individualised failure, but one in which through positive reinforcement of ‘successes’ allows individuals, and groups to step up when they are confident. It provides a video-game like process of failure/success where failure is only a learning process on the road to successful results. Above all it is a ‘safe’ environment, where the individuals are encouraged, supported, and believed in no matter what. It is a community effect – where a sense of ‘belonging’ is established and one which is extended out into the community through the child, their carers/family, and onwards through their lives if that is what they wish. There is no ‘end-point’. It is about establishing and reinforcing a community-family social network which will be supportive and caring for all involved for as long as it is possible and wanted. It is a community-building process. So that’s it more or less. That was my journey (to date) with El Sistema. Unlike Jonathan, I have moved away from the music education process, and unlike Geoff, I have moved away from the obsession of Venezuela-effect. Some might contend what I am proposing and doing, isn’t El Sistema at all but some quasi-social benevolence project, and maybe it is, but I think we need to stop it with the ‘touchy-feely’ approach to this all, get over where we started, and move to more reasoned and level ground.